The Xering will shape your legs and improve overall lower body muscle tone. Includes rubber grips for added comfort. Choose from a variety of resistance levels. The patented figure-eight designed Ultra Toner offers maximum resistance, while giving you the results you're looking for. 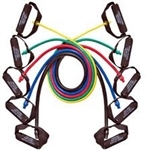 Bring your lower body workout to the max with the Braided Lateral Resistor. Designed to be extra durable with its braided rope-like construction and provides superior support with padded ankle cuffs. Get a full body workout with the Xergym Bar! Stand on the tubing for standard exercises like curls, shoulder presses and squats. The TRX Rip Trainer Basic Kit has everything you need to build dynamic, full body strength and power. Build strength, power and mobility from any door in your home, with the TRX Home Suspension Trainer. Weighing less than 2-pounds and fitting inside a lunch bag.